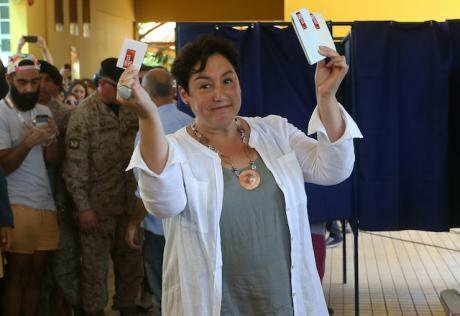 Chilean presidential candidate Beatriz Sanchez shows her ballot at a polling station during the presidential election in Santiago, capital of Chile, on Nov. 19, 2017. Cristobal Escobar/Press Association. All rights reserved.The recent results from the presidential elections in Chile, although surprising, confirm a trend that has been emerging since the election that guided the socialist Michelle Bachelet to her second term (2014-2018): the emergence of a new and open political cycle, made possible by the mobilization created by the student movement of 2011. The “Chilean Winter” of that year continues to reverberate in the political system of the Andean country. This is shown, among other aspects, by the significant vote for the presidential candidacy of the Frente Amplio (FA), a political front founded less than a year ago, which unites a large number of leftist groups and is articulated around the figures of some of the remarkable student leaders of the previously mentioned cycle of mobilization. The vote for Beatriz Sánchez, the presidential standard-bearer of the FA, reached approximately 20% of the vote, falling short of her competitor, the candidate of the ruling center-left, Alejandro Guiller, by only 2.5 percentage points. Guiller ended up participating in (and probably winning) the second round of voting against the conservative mega-businessman, Sebastián Piñera. This electoral breakthrough resulted in the election of 20 deputies and one senator by the FA, practically equalling the current government alliance in its representation in the Chamber of Deputies and, with that, becoming a force that will weigh heavily on the legislative agenda of the next government. Many of the congressmen elected by this group come from civil society, the majority, in fact, from the student movement. This social sector also obtained victories among the parties that supported the continuity of the current government, represented in the presidential candidacy of the sociologist and journalist Alejandro Guiller. That was also the case, for example, for the re-elected deputy from the Communist Party, Camila Vallejo. Moreover, within the parties that supported the current government coalition continuing in power, the results for representation in Congress tended to favor those sectors that most identified with the reforms implemented by Bachelet in her term: an educational reform that sought to de-mercantilize the system, a tax reform that introduced a redistributive function of taxes and a political reform that allowed Chile to leave behind it the electoral system bequeathed by the dictatorship, opening up the possibility that the Congress will more faithfully represent the country's diversity. To the same extent, the results hurt those who, within the coalition of the Bachelet government, opposed or tried to dilute as much as possible the reformist agenda of a presidential term that sought to institutionally channel and capitalize on the expectations for change introduced by the student movement of 2011. For some commentators, however, there is not enough evidence of the beginning of a new political cycle, because these reforms of Bachelet’s would not have consolidated social rights (above all in the educational field) and because the business colonization of political decisions would remain in force. By this reading, the "Nueva Mayoría," (NM) the broad center-left coalition that supported the second Bachelet government and brought together a wide range of parties from the Christian Democrats to the Communist Party, instead of a consolidation of social rights, would be an attempt to humanize the neoliberalism of the previous period. For its leftist critics, the NM simply renewed the crop of ruling elites by incorporating social leaders (especially from the student movement) into the political cadres of the governing coalition while recycling the old dynamics that had marked a democratic transition subordinated to the political itinerary bequeathed by the dictatorship. Despite this skepticism, the cycle begun in 2011 seems to be continuing to shape the Chilean political landscape, though not necessarily by intention. Clearly the FA electoral breakthrough is the result of that modeling capacity, but it is also clear, unexpectedly, that the Nueva Mayoría government in power is a product of the same capacity. However, these symptoms are not the defining point of the new political cycle. The outbreak of student mobilizations in 2011 allowed students to question the for-profit heart of education and thereby make the neoliberal consensus that had prevailed since the coup d'état of 1973 and up to that time, a central topic for public debate. The end of this consensus has completely altered the political landscape. The consequences may not be the "hoped-for children" for those who seek deeper changes, but the recent electoral results show, on the one hand, the end of the "transitional consensus,” based on the subordination of the political to a macroeconomic equilibrium, which has dominated Chilean politics since the 1990s and, on the other hand, the consolidation of a "reformist consensus" as expressed both in Guiller's ruling party and in the left-wing alternative of the FA. The most prominent characteristic of this new cycle seems to be, then, that the political scenario is open and that the potential for Chilean society to create itself via struggle has been enhanced. For the Chilean sociologist Manuel Antonio Garreton, the 2011 mobilizations that occurred in Chile had a potential for the country comparable in scale to those in May 1968 or the uprising in Chiapas in 1994 in their respective realities, since they expressed "beyond the protest or rejection of a certain situation, a break between the classical politics of modern societies and civil society, social movements, citizenship, or people, or whatever you want to call it, and in that sense herald a new era or time of incorporation of actors and social subjects." The mobilizations were carriers of a societal project in conflict with the traditional political actors, removing from them part of the political initiative. The traditional political world sought to incorporate the horizon of expectations released by the mobilizations: at least, that is what the government of the NM of Michelle Bachelet claimed. However, electoral participation has declined more than at any other time in the country’s history, opening, according to Garretón, a profound breach that could be synthesized in the formula of a "politics without society and society without politics." To what extent do the recent election results force a reevaluation of this model? While the reemergence of social movements has allowed us to question a Chilean neoliberal model that has been presented as successful and desirable for the rest of the continent, demonstrating its fissures as a development project, at the same time this social role has not been associated with a matching capacity for instituting this new imaginary. Although the second Bachelet government and its coalition (2014-2018) aspired to represent and channel this disaffection into a series of reforms; despite the emergence of a developing, radical left wing (FA) with a significant electoral impact; the bridges between social unrest and institutional political participation have not yet been built, although they are already outlined. The political effects of the recent era of mobilization have not been exhausted. In fact, one must consider the critical potential that this could have for an upsurge in governments that are pro-neoclassical strategies, given that the model country for neoliberalism in the region (Chile) has been belatedly advancing to the thematization of the Washington Consensus. Everything seems to indicate that the tide of progressive governments in Latin America is waning, either because of the electoral defeats that leftist governments have recently suffered (Argentina, Bolivia and Venezuela) or due to the emergence of dubious institutional mechanisms that have removed democratically elected presidents from their offices (Paraguay, Honduras and Brazil). But how should we envision the position of Chile in this reordering of continental political forces? It could be said that Chilean policy has tended to be rather counter-cyclical in relation to regional realities for the last 20 years. That is, the Andean country's policy has accompanied Latin American power trends at its own rhythm, anticipating or incorporating, belatedly, the inclinations of the rest of the neighboring countries. The economic metaphor is not accidental: it seeks to reference, on the one hand, the asynchrony of the local political rhythms of this country and, on the other, to emphasize the potential counter-trends that Chile may eventually activate in the regional context. According to Jorge Castaneda, the Latin American shift to the left was in fact of two types: an incorrect left, that is, populist, refoundational, and anti-globalization; and another that was correct, that is, responsible, moderate, and institutionalist. Chile, in order to maintain the "neoliberal consensus" in its economy, was the main incarnation of the latter, being a potentially attractive model for reversing post-neoliberal aspirations in the region. Now, with the decline of the Latin American progressive cycle, it is worth asking: to what extent does this new political moment in the Andean country mark a potentially counter-cyclical breakdown in relation to the progressive decline observed there? The end of the turn to the left does not mean that projects of that nature disappear, what regresses is the continental dimension of their imprint. Moreover, no matter how much the end of the progressive cycle is anticipated, its consequences are likely to continue operating beyond its extinction. The influence that "refoundational" governments exert and will exercise on new experiences of building the left in Europe or in other regions of the world remains to be pondered, a source of inspiration claimed by such cases as PODEMOS in Spain, "La France Insoumise" and Corbyn's Labour. At the same time, it will be necessary to consider the impact of return that a possible new European progressive cycle could have, if something like that happens, in Latin America and in the possible revival of these projects on a regional scale. Part of that return is already reflected in Chile in the recent election results of the FA. It appears that Chile continues to march to a different drummer than the rest of the region. Today, when these governments, to a large extent have lost the capacity to reproduce or maintain power, opening the way for governments that embody traces of the neoclassical project, Chile seems to have a new setback, belatedly questioning the neoliberal consensus and the political logic of the ‘democratic transition’ that allowed its perpetuation. Although the end of the neoliberal consensus does not mean the end of neoliberalism, it does contribute to the delegitimization of its proposals and, therefore, diminishes the scope of the Chilean path to neoliberalism as a regional model. It is possible that the recomposition of the neoliberal option in Latin America could be carried out without its principal local emblem. In this sense, Chilean politics, thanks to the cycle of recent mobilizations, may have a counter-cyclical potential in the region, inspiring and making possible new projects, and new alternatives to neoliberalism. The author thanks Leesa Rasp for the translation to English and Geoffrey Pleyers for his generous comments. Any error is solely the responsibility of the author.